Because my traumas were medical in nature, it has been challenging for me to handle any appointment with a doctor or dentist. At any moment in a medical appointment, I can suddenly begin feeling a bit dizzy or dissociated, spaced out, begin staring into space, lose the ability to articulate myself well, become very subdued, or begin to feel sad, uneasy, nervous, jittery or on edge. I may even begin to feel panicky. Earlier on in my PTSD I would feel much more dramatic and overwhelming reactions like crying, feeling faint and feeling sick to my stomach. Sometimes I don’t realize I’m triggered; at other times it’s pretty obvious and I have to scramble to think of ways to calm myself that I have learned in therapy or by self experimentation. My nervous system doesn’t care how much I might want everything to go easily at the appointment, or how hard I try to make myself believe everything will go fine. Even if prior to the appointment I think confidently that nothing will happen during the appointment, actually there is always the chance I will get triggered at any medical or dental appointment, no matter how unrelated it seems (intellectually) to the traumas or how long I’ve been working on my recovery. Generally I’ve just been winging it at appointments and don’t prepare at all. I realized recently that if I prepare myself before any medical or dental appointment by bringing along a list of things to do when triggered, I probably will have a somewhat better experience. If I have a list with me, if I get triggered I can look over the list rather than try to bring up something from memory, which can be impossible to do when in the midst of being triggered since many times part of being triggered is losing the ability to think, remember and reason. And bringing a list is also a great way to practice self-care. Every time I practice self-care that skill set, or the “self-care muscle” so to speak, gets stronger. Sometimes, there isn’t time to do very much during the appointment. If the appointment is rushed, I try to observe that I’m feeling dissociated or nervous or blanking out mentally. I make a mental note of these various different states and then look over the list right after the appointment to work with these feelings. Also, if anything happens to come up on the way to the appointment or in the waiting room, I can have the list handy and address the difficult feelings by reading over the different things to do. There are many things we can do before and after an appointment to help regulate, calm and stabilize ourselves, we just need to remember to do them. I think for my next appointment, I will ask my boyfriend to have one technique from the list ready that he can do to help. It feels awkward asking, but I think it could make a huge difference so I will push myself to make the request. If you do ask and someone is willing to come along with you for the appointment and help (kudos to you and them for this level of being trauma-informed by the way! ), be sure to tell them what to look for – teach them what the signs are that you are getting triggered. I realized recently that for me, being silent and “zoned out” is actually a sign that I’m very triggered. It’s a really subtle sign and could go unnoticed because, well, I’m not doing or saying anything. For my next appointment I’m going to educate my boyfriend about what to look for. I will ask him to notice if 1) I’m looking out into space blankly like a zombie, 2) if I look like I’m sad (have a somber expression, slumped shoulders), 3) look antsy like I’m fidgeting and looking around in different directions, or 4) become unable to express myself very well like I’m looking for what to say but am not finding it. So, if he sees any of those things, I’ll just teach him one technique for now. For me, just having him put his hand on my arm or leg can make a world of difference (called Connecting Touch in the list). So I’ll start there. I have appointments almost every day this week so I have ample opportunities to practice! Note that everything is phrased in terms of someone else helping the person with PTSD. If you are using it for yourself, just do the various suggestions for yourself (as if you are both people). Place. Remind them where they are. Date. Remind them what the date is. Safe. Remind them that they are safe now. Differences. Remind them how this procedure differs from the one that harmed them. Breathe. Remind them to breathe deeply and to feel the breath in the nostrils. Breathe with them. Connecting Touch. Just resting your hand gently on the person – for example on their shoulder, arm or knee – can help to ground and settle them. Do it with the intent of connecting with them as a support. Ask permission beforehand. Ground-5 Senses. Ask them to name something for each of the 5 senses – something they can see, hear, smell, touch, taste (or recently tasted). Ground-Pressure. Press down on their lap, feet or shoulders to help them feel grounded. Use your feet to gently but firmly press on their feet. Ask permission beforehand. Self-Hug. Suggest they hug themselves tightly for a while; suggest they sense where their edges are. Self-Holding Exercise. Suggest that they put one hand on their heart and one hand on their belly and describe all the different sensations they feel in the places the hands make contact with the body (one and then the other). Heart Stroking. Have them put their fingers above the center of the chest an inch below the collar-bone and gently move them straight down about four inches going over the breast bone. Repeat. It’s like stroking a cat gently on the head. Tactile Objects. Give them strange feeling or textured objects to feel. Examples: silly putty or “therapeutic putty,” seed pods, stones or other things from nature, toys, a bean bag, a soft blanket. Tell them to feel, squish or squeeze the object, focus all their attention on how it feels, and describe out loud what it feels like to them. Cold Water. Give them cold water to drink or to put their fingers in. Tell them to focus on the cold sensation. Cold Washcloth. Give them a cold wet washcloth to manipulate with their hands or put on their arms, forehead or face. Ice Cubes. Give them ice cubes to feel with their hands. Grounding Pillow or Blanket. Give them a grounding pillow, grounding blanket or just a bag of rice/beans. Rest it on their lap or feet; let them squish it in their hands. Stuffed Animal. If they have a stuffed animal they associate with feeling comforted, holding it may help. Music. Bring some music/nature sounds that is calming and offer it to them. Medication / Supplement / Tea. If they have a medication, supplement, herbal tea, etc. they have experienced to be effective for anxiety in the past it may help them get through the appointment with more ease. Service Dog. If all of the above doesn’t work that well after repeated attempts, you may want to consider whether the person would be an appropriate candidate for a service dog as service dogs in many cases can calm the nervous system effectively when other things can’t. Any item on this list may, for whatever reason, not work or have a negative effect even if it has worked in the past. So always check in and see if it’s causing them to feel more calm or more anxious and dissociated. Go over everything to make sure you have the plan down. Make sure that nothing you bring is a trigger. 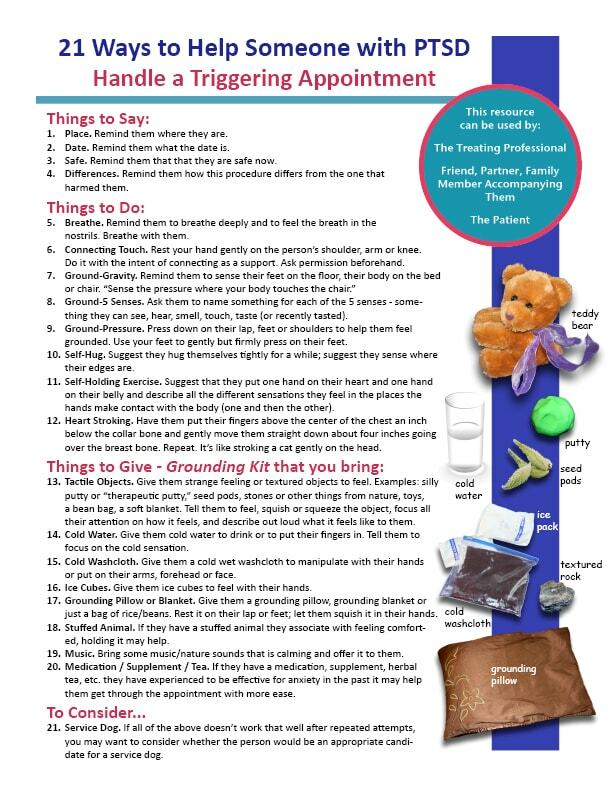 Create the Grounding Kit – gather as many grounding items you can and put them into a bag to bring with you. Understand that your friend may need some help on the way to the appointment or even the day before, when they could already be feeling anxious in anticipation, as well as on the way home and at home after being stirred up by the appointment. This list is available as a downloadable PDF that has been formatted for printing. Click on the image below to download the PDF file.